It’s no secret that I’m heavily inspired by the French-girl style of dressing, I’m forever admiring images of Jane Birkin swinging around her basket bag and wishing that I was strolling along the French Riviera with my own in hand. There’s something very unique and mysterious about being so effortlessly stylish and put together, they make it look so darn easy! The magical unicorns of the fashion world. 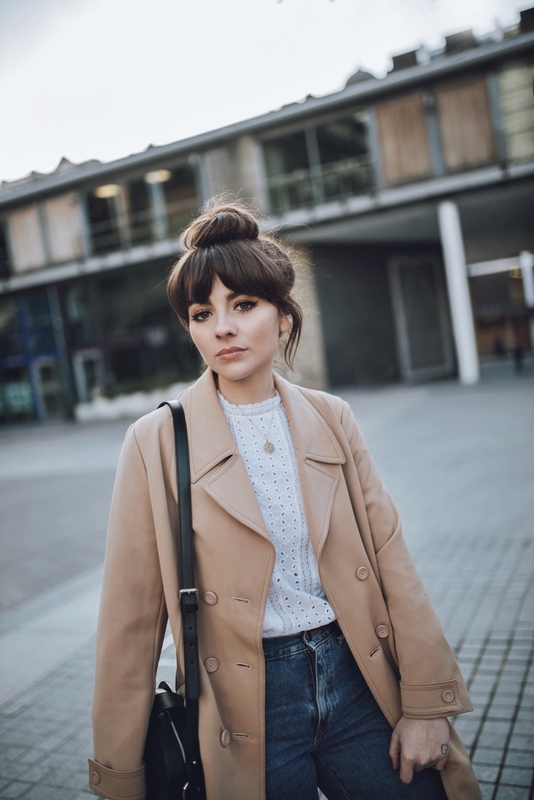 With this in mind, I thought I’d put together, perhaps the first in a mini series of posts, a weather appropriate ‘French girl capsule wardrobe’. All the pieces I’ve been reaching for lately on my never ending quest to touch into my French girl roots – my dad’s side are French-Canadian, so this has to mean I’m half way there right…? 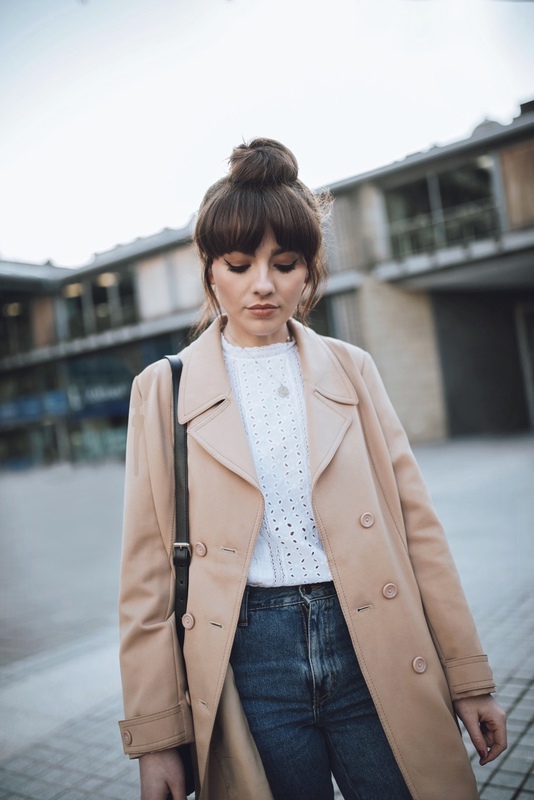 High neck blouses are amongst some of my all times favourites – they come in an array of shapes and sizes, and instantly make an outfit look effortlessly elegant and put-together. My favourite thing to do (surprise surprise), is team them with a pair of high waist jeans and strappy shoes. The denim adds that tough edge and creates a little contradiction to the outfit (that added interest so to speak), and the strappy shoes tie in the classic feminine theme at the bottom and bring everything together in a nice little bow. A high neck blouse is ideal for this time of year, particularly one with cut out detail like I’m sporting above, it’s such a beautiful thin cotton material that it doesn’t feel out of place on a warm sunny day. Personally, I love wearing jeans on nights out too – but I can be a bit of a one trick pony. To dress this outfit up, I’d add a touch of red lipstick, and maybe switch things up with a pair of tailored black trousers. That’s the great thing about a Victorian style blouse, it’s such a versatile piece and one that I find myself reaching for for a multitude of occasions. They also set off a structured jacket/coat like nothing else. I’ve been teaming mine with a light weight trench coat and my vintage navy blazer that I can’t seem to part with lately. Whether it’s high neck or ruffles, a little white statement blouse is a sure fire way to nail a Parisian inspired look. The piece de resistance to any French girl’s wardrobe – a classic staple that has been around for what feels like forever. They look great on all genders, shapes, and sizes, they can be dressed up or down, worn short or long, and pretty much epitomise the vastly sought sober French-girl style. I’m not sure if the jacket I’m wearing above would be strictly considered a trench coat, but let’s just roll with it anyway. 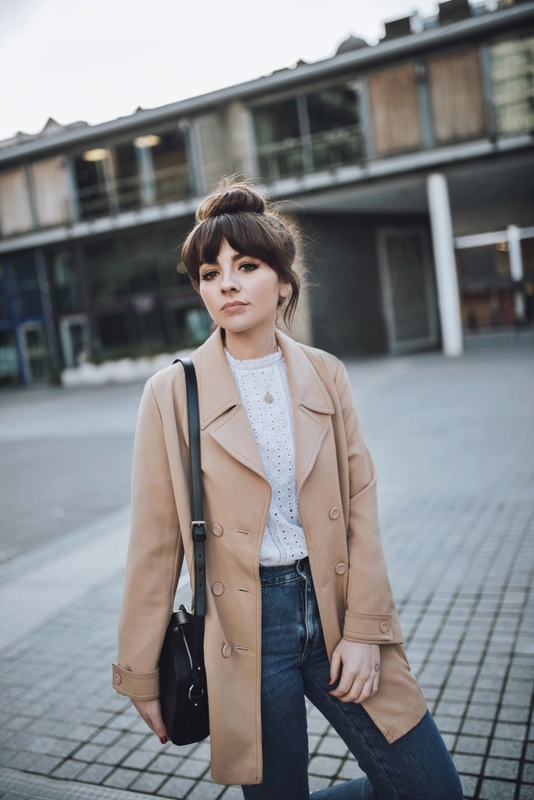 I have a couple of trench style coats in my collection and this is the one I’ve been reaching for the most lately (thanks to the unlikely Manchester sunshine). 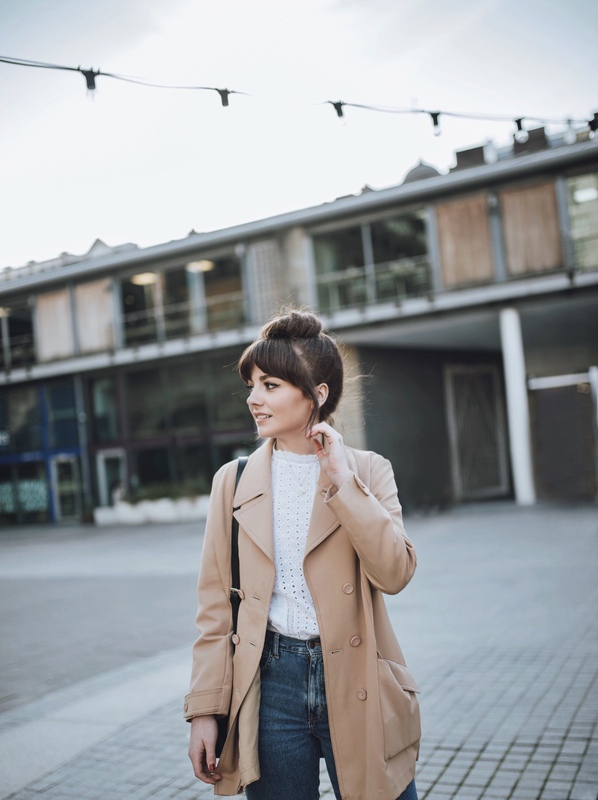 I love how it looks in contrast to light wash denim – it really ties the whole outfit together and makes it look like I’ve got my act together. I think that’s the great thing about this style of coat – they instantly make anyone look like they know a thing or two about style. You could be wearing the most simple/casual attire ever, but throw on a trench and you’re ready to face anything. 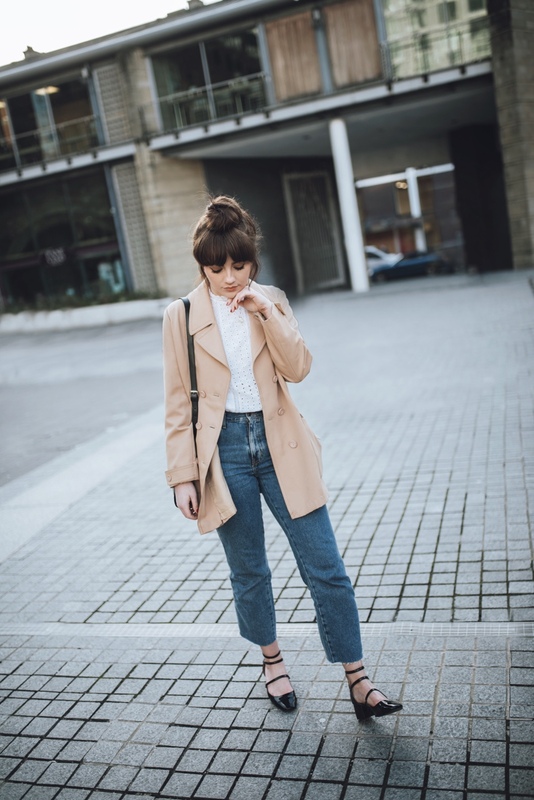 There’s been a bit of hybrid trench coat around lately, or, ‘the new trench coat’ – a kind cooler/less tailored version of the original that I’m very on board with! 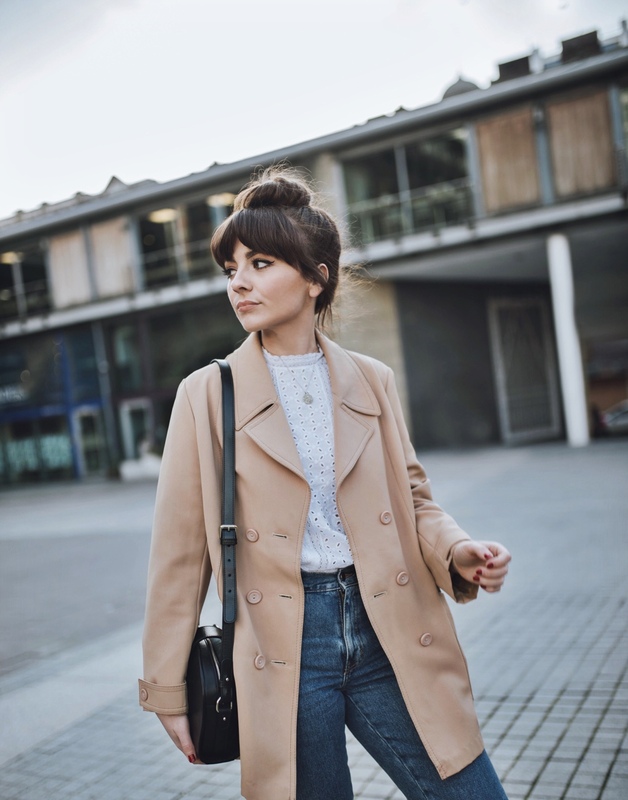 I’m still on the hunt for the perfect style – I’ll link a few below that I’m lusting after at the moment, and be sure to keep you updated on my quest. Weather it’s frayed, crop flares, or straight legs a plenty – a great pair of denim jeans is a must have for everyone in my opinion. If you’ve read my blog for a while, you’ll already be aware (and probably bored) of my love affair with denim. I really need to prise myself away from them and start investing in some different styles, but I just can’t seem to! They go hand in hand with stripes (another French-girl staple), and pretty much everything else in my wardrobe. For Spring, I’ve been loving crop flares with a slightly frayed edge. I think they just add a cool edge to any outfit. Particularly in contrast to a structured jacket or blazer – to me, they are the quickest way to create that laid back/French-girl feel to any outfit. My addiction at the moment it would seem, is just collecting all the ankle strap shoes in as many different styles as I can find. Weather it’s black, red, metallic, or a contrast toe cap design – they are a one way ticket to guaranteed outfit elevation. The lazy girl’s trick to instantly dressing up an outfit when you’ve found yourself with ten minutes left before you have to head out the door. You could be wearing a plain T-shirt and jeans, but add some ankle strap shoes and it’s a perfectly acceptable evening outfit. A touch of red lipstick and nobody would assume a thing! The key is to getting jeans that flatter your figure and sit nicely on the waist, then letting the shoes do all the talking. 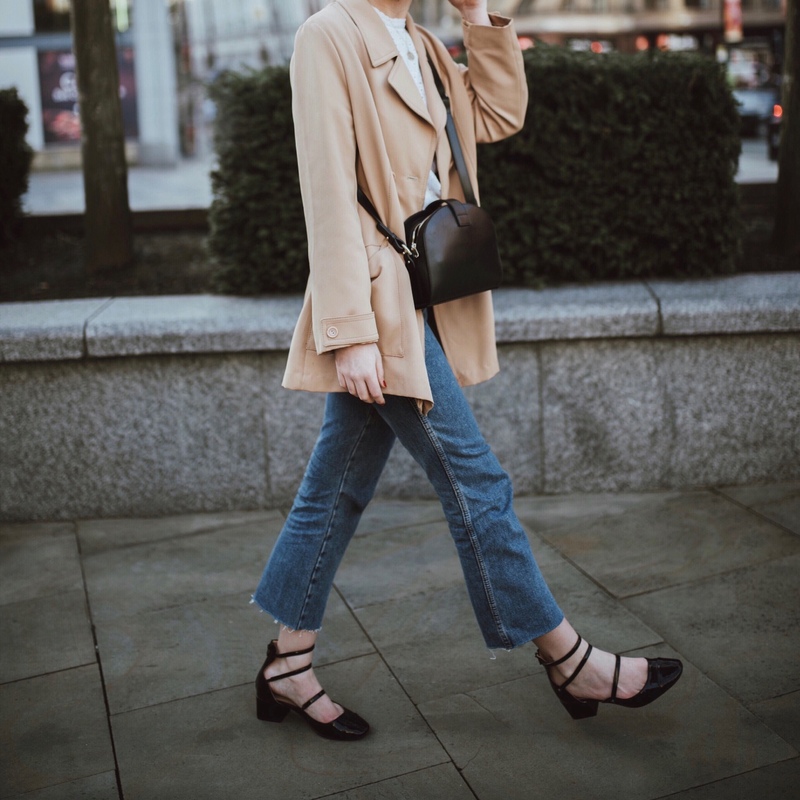 There’s so many affordable options on the high street too – you don’t have to invest a fortune to make them part of your wardrobe if you’ve been feeling unsure. I personally find them so so flattering, I don’t have the longest legs and they can often look a bit chunky. With this in mind, a strappy/slightly pointed shoe is a life saver and creates the illusion of longer legs. I always opt for a small heel as I’m just not really a high heels type of gal, mainly due to the fact I can’t walk in them without looking like a total idiot. I’d rather save myself the embarrassment and stick to a low heel that won’t completely cripple my feet. Amazing with midi skirts and dresses for Spring, and will carry your outfits through to Summer and beyond! The little bag of tricks that I couldn’t be without. There’s just something about this style of bag that completes an outfit for me. They have been more popular than ever lately, and seem to be getting smaller and smaller! I have a couple of tiny/camera bag style ones that I like to keep for the evening – they look great worn across the body with a little dress. For daytime, I love this half moon shaped one by Sezane. I first fell in love with it because it reminded me of the APC one that I have lusted after for a while now, it’s just a great little everyday bag that’s big enough for all my essentials. Nothing will ever look more French than a little wicker bag, but I really think there’s something very Parisian about a classic/well-made cross body bag. Stylish! Do you like her daughters’ style? Charlotte and Lou? Simplicity at its best <3 This outfit is so pretty and delicate !